Everyone wants to know what seafood is green enough to eat. One's taste for seafood is often dictated by culture, geography, religion, tradition, income, and, of course, taste. Whatever your reason for wanting seafood, we at NAMA are not a big fan of declaring any specific species "green." Too often many factors that can help determine the "green-ness" of seafood are ignored in the attempt to make it easier for us to make purchasing decisions at the cost of the oceans and those who catch the seafood we eat. In fact, most of the current standards do not recognize the ecological value of locally caught seafood. We believe when it comes to who should catch our seafood, connection to coastal communities creates a much stronger sense of conservation and stewardship than a connection to Wall Street. Without addressing these issues fish considered "green enough" to eat by various labels, standards and certifications could easily end up on the list of over-fished species or create other environmental or economic ripple effects. Take Atlantic herring, for example. In the late 90s, herring was green-lighted by some seafood standards because herring populations were considered robust by today's fisheries management policies - which are a huge part of the problems facing our oceans. But Atlantic herring is a critical part of the diet of many recovering marine animals living in the waters off of New England. Herring's population rebounded after being over-fished by factory vessels off the coast of New England in the 60s and 70s. But many of its predators' populations have drastically declined due to a variety of environmental stresses - including overfishing. Unfortunately, fisheries managers seem to look at the ocean as a body of water full of single species of fish we like to eat rather than an ecosystem. But it takes an ecosystem to save the oceans or a single species of fish pleasing to our palates, so the relationship between the predator and the prey - such as that between herring and its many predators such as cod or whales or seabirds or bluefin tuna - need to be accounted for properly when management decisions are made. This lack of accounting is one of the many flaws of fisheries management policies today. Even worse, food fish like herring are usually small, economically low-value fish which means a lot of them need to be caught to make catching them profitable. As a result, they lend themselves to industrial-style, factory fishing operations. Herring's history alone tells us that is not good for the fish and the rest of the ocean - not to mention the coastal fishing communities waiting for many of herring's predators to rebound to an ecologically sound and economically sustainable levels. Herring is just one example of the complexities involved in declaring a particular seafood "green." We believe the more we know about what happens to the fish that end up on our plates the more likely we are to get involved in the policy level changes that need to take place to ensure that the oceans are healthy enough to continue feeding us - and all the other creatures that feed on the seas - for generations to come. Buy from a local fisherman when possible. Doing so helps a more sustainable way of life and better jobs in traditional fishing communities. Eating local seafood means fishermen get a better return on less catch - which in turn means the ocean gets a break. Money spent locally tends to stay in the community, which for those of you who live in coastal communities means you'll be supporting your own local economy. Buying from a community-based fisherman also ensures to some extent that you are eating fish that is "in season" rather than perpetuate the century-old demand for "any seafood, any time" regardless of the ecological consequences. Get involved in a Community Supported Fishery (CSF). NAMA is actively working to create CSFs in New England and provide the basic tools to fishing communities in other regions interested in staring a CSF. In addition, we are working to broaden the market for CSFs and other fishing community-based seafood marketing efforts by building connections between these organizations and sustainable, regional markets through working with chefs, restaurants, co-operatives, farmers' markets, local food enthusiasts and Community Supported Agriculture (CSA). Fishermen or consumers looking to start a CSF can find the tools they need to get started in our CSF Bait Box. What if you don't live near the coast? We highly recommend that you stick with eating what's available to you locally as much as possible. If you need to have seafood, look at the rest of our suggestions below and stick with what has had to travel the shortest distance to get to your table. Eat fish that looks like fish! That's a funky way of saying stay away from overly processed fish that is turned into squares or fingers or some other shape. And don't be afraid of whole, bone-in fish. Good cooks know that's where the flavor is! For a good, easy recipe for using a whole fish, check out the No Fuss Fish Soup recipe used by Angela Sanfilippo of the Gloucester Fishermen's Wives Association at a seafood demonstration organized by NAMA as part of our Seafood Throwdown series this summer at Cape Ann Farmers' Market. Avoid fake or imitation seafood products. Majority of fake seafood products comes from factory style fishing operations. Alaska Pollock is probably the number one fish that is on the market today in just about every form and shape. It's turned into surimi to make fake lobster or crab or some other fake seafood product. Incidentally, like herring, Alaska Pollock is an important part of the North Pacific's food web. Eat wild seafood whenever possible. Some shellfish are farmed in operations that produce healthy animals and do not compromise the ecosystem in which they are grown. However, it is often difficult to get the information that will allow you to make an informed decision. With a few exceptions, shrimp is usually farmed in coastal areas of Asia and South/Central America where it destroys wetlands, introduces chemical pollution and disease, and may foster poor treatment of laborers. Most shrimp consumed in the US is farm raised and imported. Also, for all farm-raised seafood, do not trust an "organic" label, as true standards are not yet developed. If you can't get the information you need, opt on the side of caution and go wild! Ask how, where, and when your fish was caught. 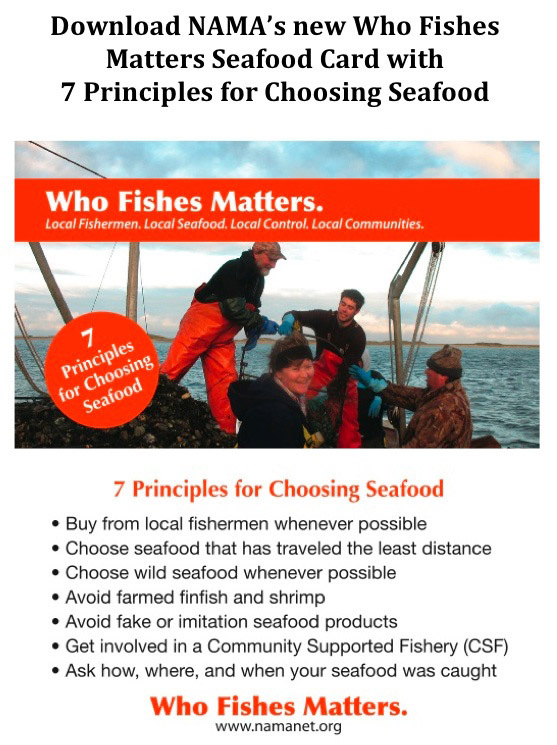 Doing so lets your seafood dealer or waiter or chef know you care about their buying choices. If whoever is selling or serving you the fish doesn't have the answers, or the answers you wanted, don't buy or order it. We wouldn't have to think this hard about what we eat from the seas if policies and regulations were ecosystem and community based. NAMA believes that through a grassroots movement of fishermen, fishing community organizations and those who eat their catch we can transform today's fisheries policies towards ones that recognize the oceans are complex ecosystems and not bodies of water that magically produce single species of fish that pop onto our plates. And, who catches what does pop onto our plates matters.